1. LORENZO ANDOLFATTO Making sense of Incompleteness: Approximations of Utopia in Liang Qichao's Xin zhongguo weilai ji and Chen Tianhua's Shizi hou. 2. GIORGIO CASACCHIA Travelling in a Thronged Desert. 3. CHEN YUSHU The Tension between the Realistic and Imaginary Elements in Alexander's Illustration. 4. DIEGO CUCINELLI Windows onto the Supernatural in the Second Half of the Edo Period: from the Gazu Hyakki Yagyo (1776) by Toriyama Sekien to the E-hon hyaku monogatari (1841) by Takehara Shunsen. 5. DONATELLA FAILLA A Virtual Escape from the "Closed Country" through Painting and Humorous Verses: Shiba Kokan's Seiyo mitate Mimeguri fukei zu. 6. GIULIA FALATO Alfonso Vagnone S.J. 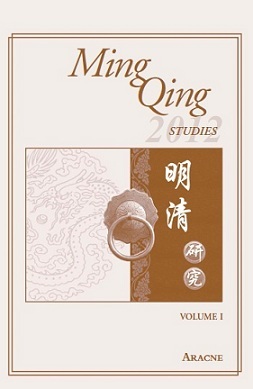 's "Tongyou Jiaoyu (Child Education)" and its Contribution to the Introduction of Western Learning into Late Ming China. 7. GAO YUNWEN Nationalism, Ethnicity, and Colonial Modernity in Liang Qichao's Ban Dingyuan Conquering the Western Region. 8. MARCO MECCARELLI Chinese Painters in Nagasaki: Style and Artistic Contaminatio during the Tokugawa Period (1603-1868). 9. MARTINA TURRIZIANI The Historical Comparison between Italy and China Emerging from Kang Youwei's Yidali Youji. 10. BARBARA WITT Child Imagery and the Representation of Li Nezha in the Fengshen Yanyi. 11. XIE MINGGUANG Translation, or Transliteration? The Question of Chinese within the Catholic Liturgy in the Xiru Ermu Zi (1626). 11. XIE XIN-ZHE Forensics and Politics in Qing China - A Beijing Case.